In a recent Chit Chat Across the Pond segment on episode 484 of the Nosillacast Mac Podcast myself and Allison walked through the process of creating an automator action for generating secure memorable passwords with the XKPasswd 2 perl module (we basically walked through the steps in this blog post). During that discussion Allison mentioned it would nice if Automator could play a sound when it was finished so you could know when automator was done generating the password without installing a third-party notification app like Growl. At the time I didn’t know of a way to do that, but now I do, and it’s really quite straightforward thanks to the OS X terminal command afplay which will play an audio file without opening any sort of GUI. A few weeks ago on the Chit Chat Across the Pond segment of the Nosillacast, I mentioned that I had an OS X service set up to generate a random password using my XKpasswd Perl module and copy it to the clipboard. Listeners enquired as to how they would go about doing that, so as promised, here’s a quick tutorial. Obviously this tutorial is for Mac OS X users only, because OS-wide Services and Automator are OS X features. The screenshots are taken on 10.8 Mountain Lion, but this same technique definitely also works on OSX 10.7 Lion, and probably even on 10.6 Snow Leopard. 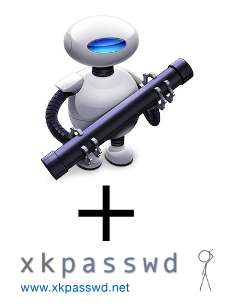 This tutorial also assumes that you have downloaded the XKpasswd module, and saved it somewhere on your computer, along with either the sample dictionary file included with the module or one of your own making, and that you know where on your computer those files have been saved. In other words, you need to have XKpasswd.pm and a text file with one word per line somewhere on your hard drive. In my sample code I’m going to assume you’ve installed the Perl module to the suggested location, /usr/local/xkpasswd/XKpasswd.pm, and that you have customised the sample dictionary a little (more secure that way), and saved it to /usr/local/xkpasswd/dict.txt. Some Apple haters just love to say that there is nothing to a Mac except for flashy marketing. There are a million different reasons that’s BS, but one in particular is ease of automation. The learning curve to start automating your Mac is very short and very gentle. Without ever seeing a single line of code you can add your own custom functionality to OS X to relieve you of your most boring repetitive tasks. If you can tolerate seeing a line or two of code, you can take things even further and tie Unix command line tools straight into your GUI. The best candidates for automation are simple repetitive tasks that you do often. You might only save 30 seconds each time, but if do that 10 times a day that soon adds up! In this post I just want to give three simple examples to whet your appetite and hopefully get you thinking about some simple tasks in your computing life that you could easily automate. When OSX came out there were three new features that Steve ranted on about. 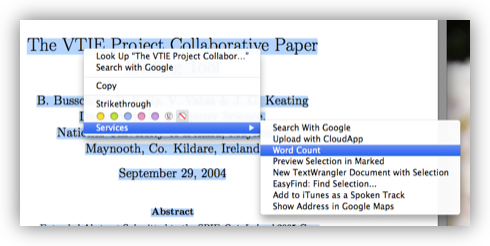 The first was Spotlight, which I use a lot and really like, the second was Dashboard, which a quick scan of the articles in the Mac section of my blog will clearly show I like a lot, and the final one was Automator, which I’ve really neglected. I never even bothered to play with it properly until today! But, better late than never and since I had a free hour and some backups I wanted to automate I figured I’d give the classic rsync shell script approach a miss this time and see what Automator could do for me. In case you’re not familiar with Automator the idea behind it is that you can write scripts to automate repetitive tasks or tasks that you do a lot but without typing or seeing a single line of code. For the full Apple hype have a look at the Automator page on the Apple Site. So, the question is, does Automator live up to the hype? Well IMO it does. It did take me a few minutes to get into the swing of things and I have to say I’d probably never have figured it out without looking at the sample workflows but once I got into it it was dead easy. You just drag and drop in the actions you need in the position you need them and then tinker with the options on each action until you have what you need. Something I found really helpful was that you can create complex workflows by chaining together simple ones. I initially started by trying to write one killer workflow that would deal with all elements of my backup but I soon realise I would be much better off breaking the task up and then creating the killer workflow by adding together all my small workflows. Within 30 minutes of starting to play with Automator for the first time I had the above done, tested and working. I can now very easily and very quickly backup my important stuff to my samba share. Below are some screenshots of some of my workflows to give you an idea of what the interface is like. (above) The workflow for backing up my email. However, there are a few things that annoyed me, firstly, Automator crashed once when it had just finished saving a workflow. I’m not accustomed to Apple programs crashing so that worried me a bit but it only happened once and since then I’ve been poking around with automator for hours with no more crashes. The other thing is that I can’t get the action for disconnecting from the share to work. I’m not sure if the problem is with Automator or with OS X’s samba. Mind you samba support on Tiger has been flaky to say the least so it doesn’t really surprise me that Automator has some issues with it. The important thing is that it can connect to the share which it does without problems. Automator delivers on it’s promise of letting you do powerful things all within a simple drag and drop interface. The range of actions available is simply phenomenal ranging from simple sysadmin tasks like moving and copying files or running shell scripts to automatically burning backups to CD and automatically processing entire folders of images. Automator also integrates with just about every Apple program so you can automate more tasks than I could possibly describe here. To get some idea of how many actions there are have a look at the screenshot of the action browser pane below. Yes, it crashed on me once but I’m still very happy with it and will be using it a lot.